Open House: Sunday, Oct. 23 Noon–4 p.m.
Just in time for the holidays (when you might need an extra bedroom for visiting friends and family), the welcome mat will be out at all Coronado hotels. Sunday Oct. 23 from noon to 4 is a special day when hotels will have at least one room — several properties will have two, three or more rooms and other venues — available for touring. Plus, each stop will provide refreshments and individual drawings to win free overnight stays and other merchandise. And you never know who you might meet on the tour: many hotel owners and managers will be on hand to greet you and tempt you into planning a little “staycation” over the coming months. The hotel tour is primarily meant to be a walking tour, with more than eight hotels within two blocks of the Hotel del Coronado. Parking is free on Sundays throughout Coronado’s downtown, so hotels in that vicinity will not provide parking. However, Coronado’s two “outlying” hotels — Loews Coronado Bay Resort and Marriott Coronado Island Resort & Spa — will offer free validated parking for tour participants. This will be the first time Hotel Marisol will be on the tour. The hotel began its life in 1927 as the Blue Lantern Inn; over the past 90 years, the property has always served as a boutique inn. In June 2013, the building was purchased by Coronado real estate investors Ann Keyser and John Murphy. At the time, it was operating as the Village Inn, and was known as a quaint but somewhat tired lodging option. It had been 40 years since it had received a serious refresh. In fact, enhancements over the decades had detracted from its original elegant façade. 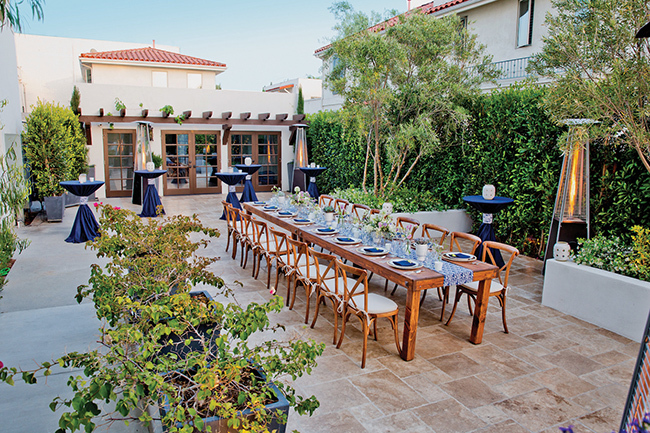 The new owners closed the property and undertook a total renovation over seven months that included a complete interior remodel, new custom furniture and the addition of a private courtyard. The exterior’s non-original stucco, paint, and awnings were removed. 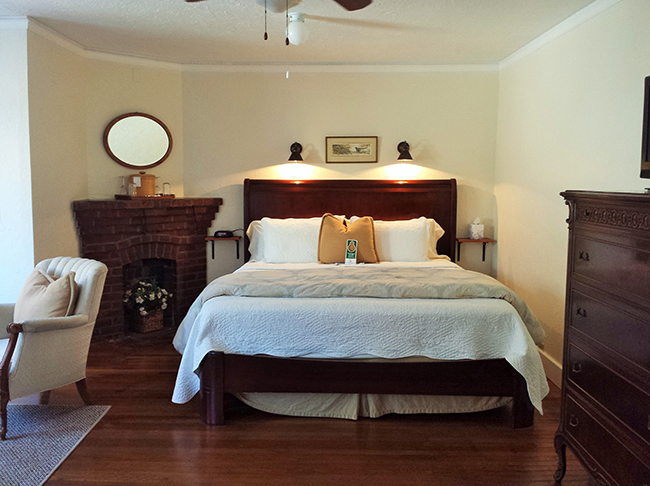 Beautiful wrought iron grilles and molded quoins and cornerstones were uncovered and once again delight guests. Hotel Marisol offers four junior suites, nine king rooms and two queen rooms, all featuring sleek and chic contemporary furnishings. 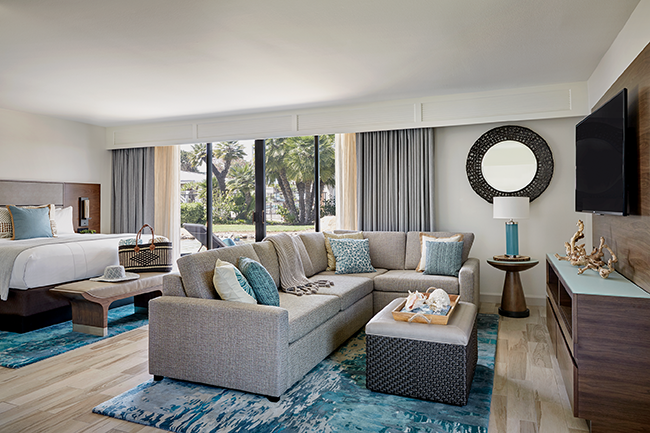 Marriott Coronado Island Resort has just completed a major expansion and renovation that includes a new 5,500 square-foot luxury spa and two-story 6,000-square-foot wellness center. 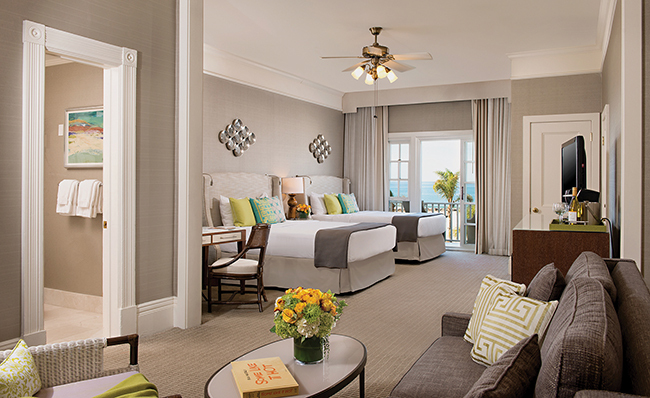 The resort’s 300 guest rooms including 263 standard rooms and 27 suites and villas, and the resort’s reception and registration areas were all part of the renovation. 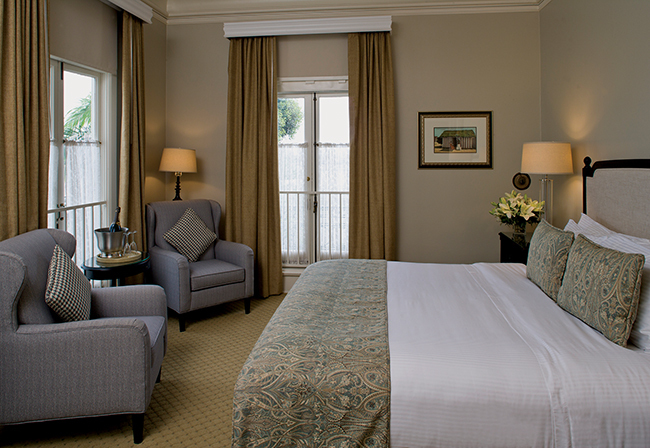 Upgraded guest rooms offer a spa-like experience; the spacious rooms include a balcony or patio, oversized tub and walk-in shower, premium Thann bath products and cozy robes. Hotel general manager Nusrat Mirza explained that the transformation emphasizes health, exploration and fun, and all the relaxation and amenities of a luxury spa and wellness retreat without the intimidation factor. “Wellness is embraced throughout the entire property, and we are thrilled to re-introduce our seaside escape and its new holistic approach to our guests,” he said. “Our refreshed focus offers guests an approachable hybrid between a spa getaway and a quick, refreshing vacation,” Mirza added. The 1906 Lodge, which opened in 2008, was sold in 2015 and now is part of the Four Sisters Inns’ prestigious portfolio of 16 boutique hotels and inns throughout California. The Four Sisters Inns originated in 1976 when the Post family opened their home, the picturesque Green Gables Inn on the shores of Monterey Bay, to the public on a limited basis. They refined hospitality to an art, carefully selecting inns for the collection, with architecture ranging from Victorian to French country to Craftsman to Cape Cod beach, in the most desirable regions of California. Of course, Coronado’s 1906 Lodge is a perfect addition to that collection! The Coronado property includes the original historic mansion built in 1906, designed in the popular Arts and Crafts style of that era, and 11 contemporary suites, many with in-room spa tubs, on the property’s perimeter. Longtime Coronadans will remember the transformation of the property to a boutique hotel that began in 2006, when the mansion was lifted by crane and supported by a temporary steel framework. By raising the mansion, work crews were able to add an underground garage, conference center, HVAC, back-of-the-house operations and storage. The product of two of San Diego’s most renowned architects, William Sterling Hebbard and Irving Gill, the 1906 Lodge’s mansion incorporates the best of both architects’ designs: The lodge’s rough stucco exterior, major box dormers and hipped roofs are typical of Hebbard’s style. 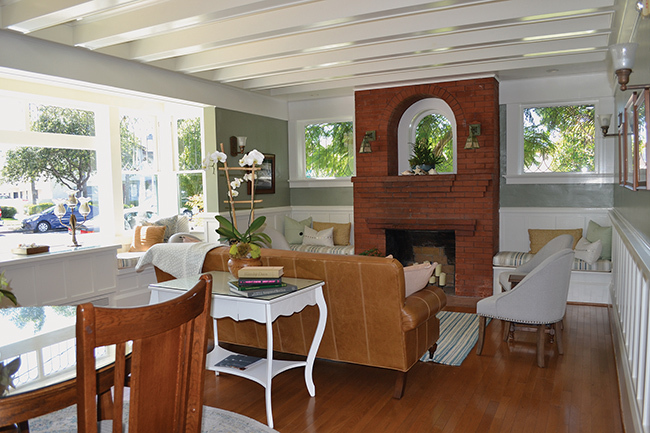 The parlor’s Mission-style fireplace with spiral leaded glass windows, along with “inglenook” box-bench seats on either side, are typical Gill elements. San Diego and Coronado museums are celebrating the life of Irving Gill this year, so architectural aficionados will be able to add the 1906 Lodge to their Gill treasure map. 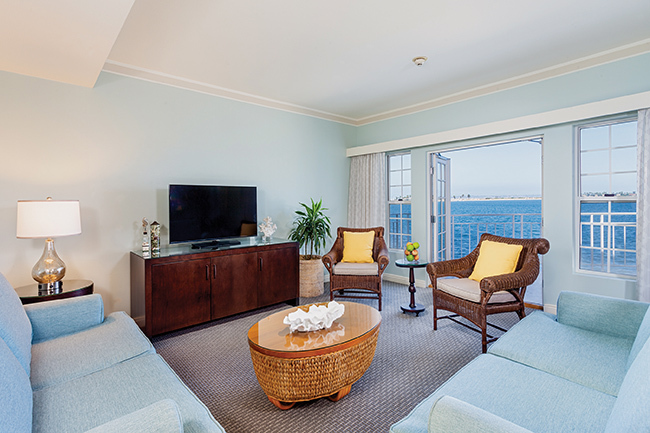 Tours of this 439-room property built on a private 15-acre peninsula will include its Bayside Suites, directly above the waters of San Diego Bay. Validated parking. 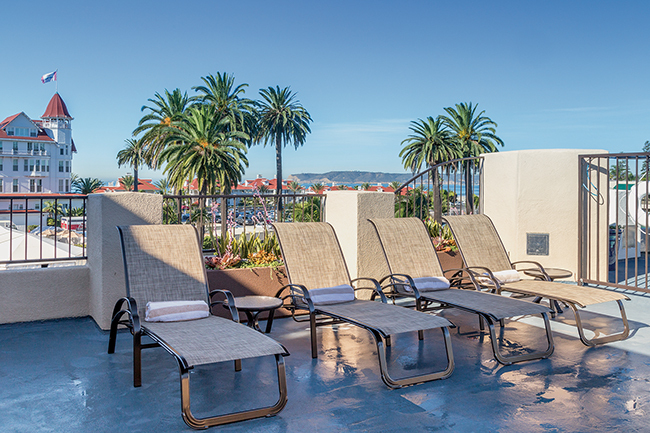 The grande dame of Coronado will have rooms open in its original Victorian building. 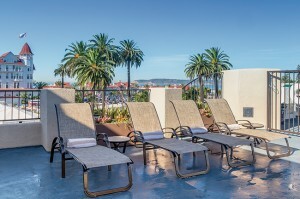 Coronado Beach Resort is a timeshare, but owners often rent out their units as hotel rooms, and all rooms at the property have been upgraded over the past year, along with its rooftop spa deck. Rooms are studios, one or two bedrooms: a one-bedroom includes a sofa sleeper, completely stocked kitchenette (just bring your groceries) and dining room table. Hotel stays and the open house tour at the Beach Resort do not include timeshare “pitches” (all units were sold years ago). Be sure to stop in at the spacious lobby to visit with Cody, the property’s popular parrot greeter. “Our guests really appreciate our history,” said Vickie Jones, general manager of the Cherokee Lodge. “We have such a great history — a house that’s been a bed and board since 1896.” The lodge is actually three houses that were put together, two of which were barged over from San Diego. 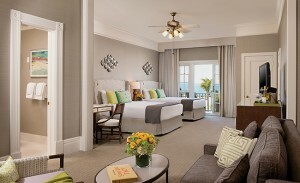 Today, guests can enjoy staying in any of the 14 rooms of varying sizes that have been recently repainted and are constantly updated, Jones said. “And most guests love to just sit outside, either on our front porch rockers or under the trees in the backyard, watching the birds and butterflies.” Owner Ed Melvin, who lives in Pebble Beach, plans to be on hand for the open house to fill guests in on even more of the lodge’s history. The little El Rancho Motel has added a junior suite with a queen bed, sofa bed and kitchenette. The 11-room property also features some of Coronado’s most budget-friendly prices, beginning with an economy room at just $79. It was July 26, 1956, when Bettye Vaughen, in her mid 30s, opened the 14-unit hotel of her own design, that included a neon “Diving Bathing Beauty” sign that lit the way to the hotel. Raised in Hollywood, the former Bettye Trowbridge was a rising talent in Hollywood that began with a successful modeling career. Howard Hawkes selected Bettye for the supporting actress role in “Red River,” starring John Wayne and newcomer Montgomery Cliff. But the recently married starlet discovered she was pregnant; she passed on the role, opting for the fulfilling role of mother, ultimately raising six children. By the 1950s, Bettye and her Navy pilot husband were living in Coronado. Bettye and her mother decided to purchase a land parcel from the former Spreckels Mansion estate to build a hotel that would offer affordable, comfortable lodging, complete with kitchens. The hotel was an instant hit. Bettye’s innkeeper for the past 25 years, John Miller, lives on the property. And every two weeks he drives north to report on hotel operations to Bettye, now 94 years young. Cherokee Lodge’s Room 2 is its most requested; it features a king bed, sleeper sofa and full in-suite bath.